Homemade ice creams are an ideal way to get kids interested in summer cooking for three reasons; they are delicious to eat, which is always a good incentive for children; they are fun to make; no complicated techniques that can leave children feel clumsy or confused, just simple processes that even three year olds can master. The ‘magic’ of making good ice cream involves some basic understanding of physics which means you can sneak a little science lesson into the kitchen. This recipe makes a pudding for six or cones fillings for a dozen children. You can also use it as a base to create different flavoured ice creams. 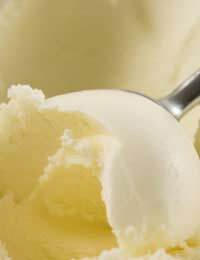 In a large bowl, beat the cream until light and airy, but not actually stiff. Set aside.Take the egg whites and either put them in a large bowl and beat with a whisk until stiff, or use a food processer for this stage. When the egg whites are stiff add the sugar a soupspoon at a time, beating it in well or pouring into through the funnel of the food processor and pulsing until fully blended and the mixture is stiff and shiny. Lightly combine the egg yolks and vanilla extract in a third bowl. Now use a spatula to fold the whipped cream into the egg white mixture – this is the time to explain how you’ve trapped air in both the cream and the egg whites and that if the mixture is handled too roughly, the air bubbles you’ve made will be broken and the mixture will become wet and heavy. It will also mean that big hard crystals will form in the ice cream which won’t taste as good. Children can hear bubbles popping if they hold a spoonful of the mixture to their ear and shake it gently. The same cooking method causes cakes to rise, with the addition of heat to the air, so understanding this simple technique can really help kids master cooking skills. When the two mixtures are combined, gradually fold in the egg yolks, adding a spoonful at a time. Simply tip the ice cream gently into a plastic container that is freezer safe. Freeze for an hour, then take it out and beat again, very thoroughly – this breaks up the ice crystals – you need to keep beating until the mixture is light and creamy. Do this again an hour later, then leave for a final four hours or overnight. A spoonful of peanut butter and a spoonful of chocolate sauce. Remove the dish from the freezer ten minutes before you wish to serve it in bowls, or five minutes before serving in cones.